This is how I roll: with Stingray Sushi Fusion food truck. That’s Right. 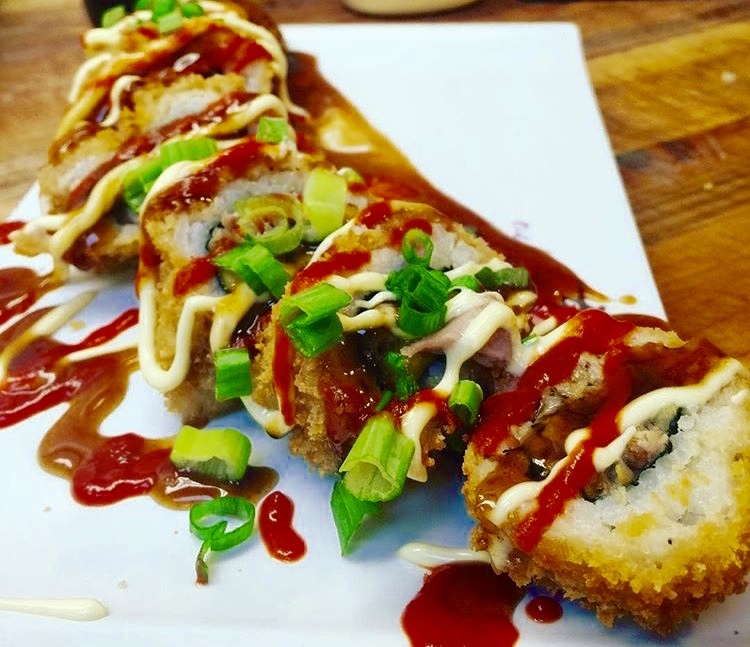 One of the most visited food trucks in Rochester is the Stingray Sushi Fusion food truck, which offers a Latin fusion with the traditional Japanese sushi that we are familiar with. So, how did this concept of fusing Latin culture with Japanese culture come about? Radhames (Rod) Veras and Kim Roth, both former California Rollin’ employees, are co-owners of the infamous food truck. Rod, feeling the need to break away and demonstrate his creativity, as well as execute great food under his own business name, began the food truck. 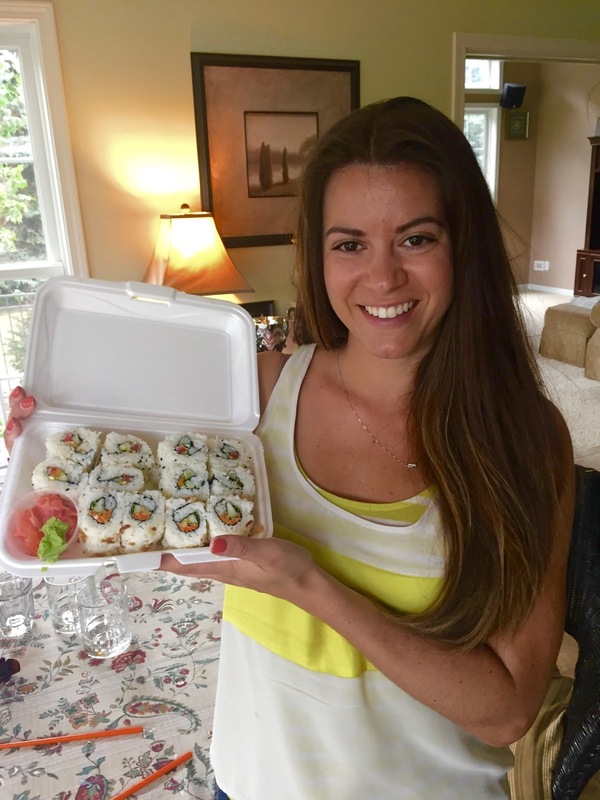 Kim soon joined the business and felt that the concept of infusing Latin flavors into sushi would be both innovative and appealing to those that may not typically choose sushi as an option. 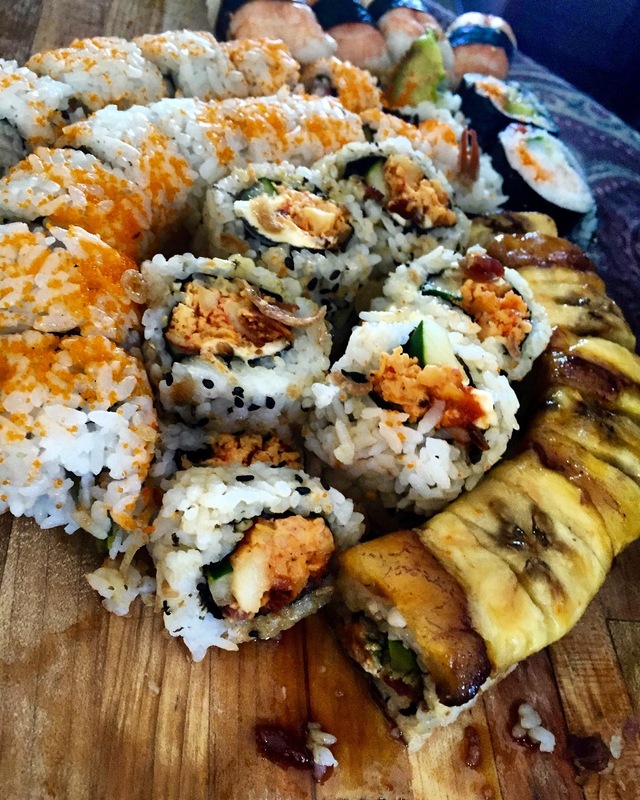 Rod brings his Dominican heritage to infuse the sushi with flavors such as saison, frier queso, and sweet plantains. 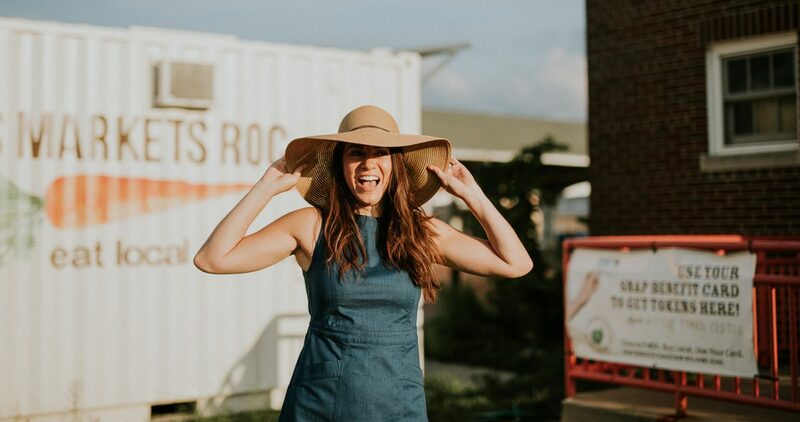 Kim brought her creative flair, bold flavors, and sushi rolling skills to the table and the two have created a beloved food truck that will leave you scraping bits off the bottom of your styrofoam container (not kidding)! Kim learned to roll sushi from her brother, who owned a restaurant in Chili. He wanted time off to play softball and Kim quickly learned plunging herself into the restaurant business. You cannot visit the Stingray Sushi Fusion food truck and not get the famous Trasher Plate. When the food truck began, Kim and Rod admitted that the first year was difficult. People weren’t entirely sure about eating sushi from a food truck. They adopted the Trasher Plate, which is sushi rice topped with cucumber, sweet bell peppers, jalapeño, tomato, scallions, bacon, friend garlic, onion crunchies, beer battered shrimp, and grilled beef, Sriracha, ginger mayo, and a special Stingray Sauce concocted with Jim Beam. This is a beautifully colorful dish that is great to share (if you dare) or to eat alone! The dish actually began when Kim’s brother created a similar version so that he could meet “the ladies” as he was a bit shy and needed a conversation starter. Kim and Rod adapted the trasher plate to what you see now – a masterpiece. They have also created a roll now named for one of their favorite customers, Ebbie Pastrana. You may know her as @ebbie_wine_kenobi on Instagram. This roll was originally a Chef’s Special, but Ebbie’s love for this particular sushi specialty item led to it being named after her! 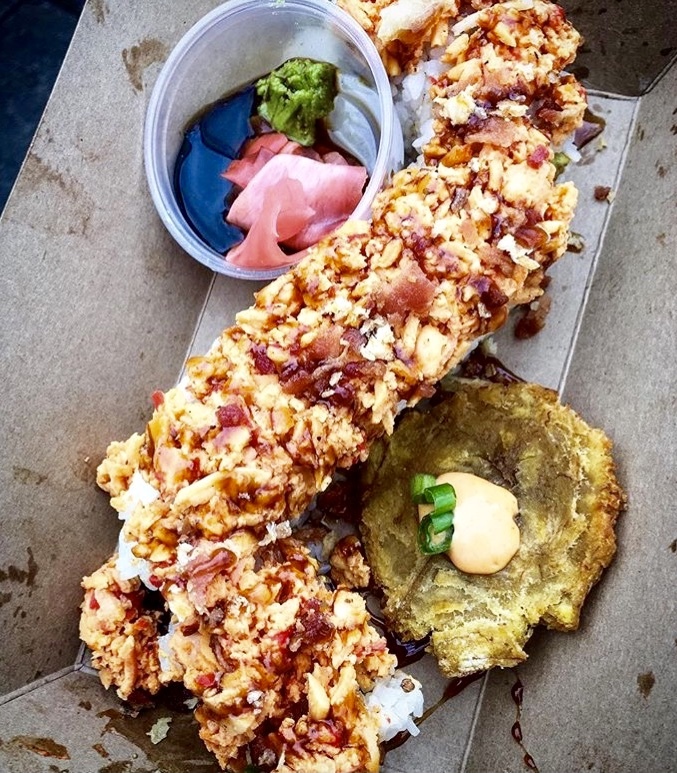 The Kenobi Roll which has crispy crawdads, avocado, bacon, Sriracha, ginger mayo, frier queso, then topped with spicy crab, onion crunchies, and Stingray Sauce will ROCK YOUR WORLD. Kim and Rod continue to create chef specials on their menu, so always be on the look out! Pictured here is a roll with roast pork, sweet plantain, scallion, and sauces. Now, you know that you can’t even handle their skillz (yes, with a z) right now, but guess what? Yes, even you can learn to roll like a sushi chef, by rollin’ with a sushi chef! “Rollin’ with my homies“(c’mon you can’t tell me that Clueless didn’t come into your mind…or Coolio). Kim Roth also has a catering company called The Bamboo Panda Catering Company, which was aptly named by her daughter Apolonnia. She reasonably stated the name fits because “Pandas eat bamboo.” Who can argue with that? 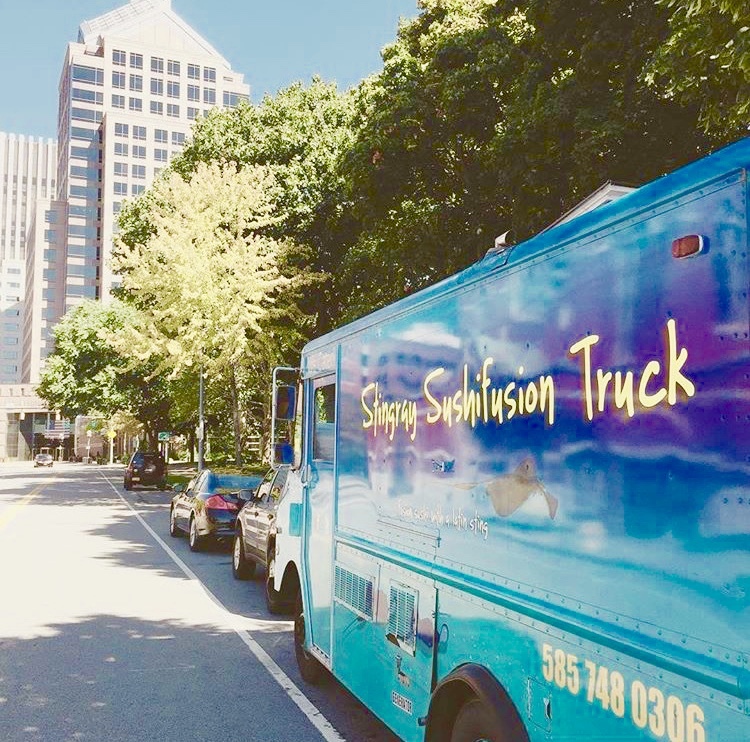 The catering company was originally designed to open as a food truck, with the design set in motion, but as Kim joined Stingray Sushi Fusion food truck, the concept changed. For just $35 pp Kim will come to your house and teach you and your friends and family how to make sushi. I hosted a class, and I can tell you that it was one of the best learning experiences. I have made sushi at home several times since the class and have gotten a big thumbs up from my husband! 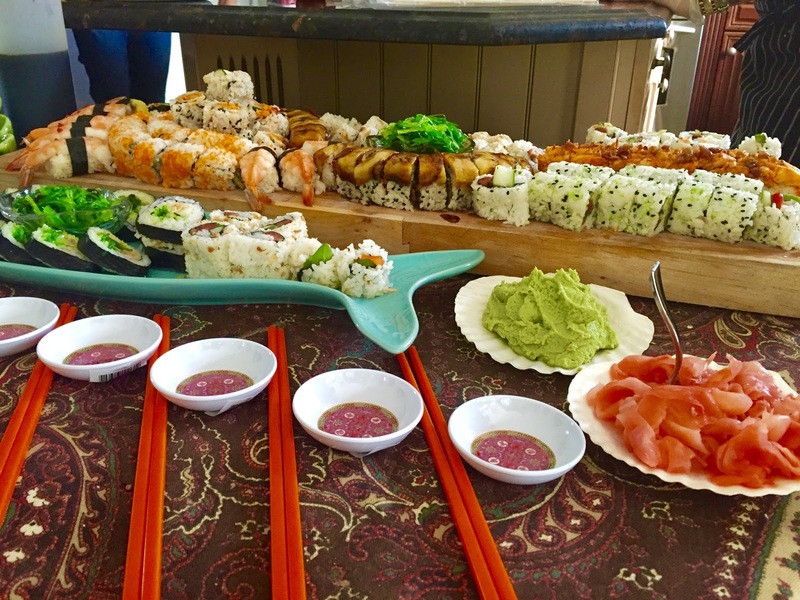 Kim will provide a large sushi platter to much on while getting to know you and your guests. Then, let the rolling begin. Everyone goes home with a kit and 3 rolls that they make on their own. Kim has also taught a class on the Hell’s Kitchen menu: Wellingtons, risotto, and scallops. Need a private chef or a party catered? 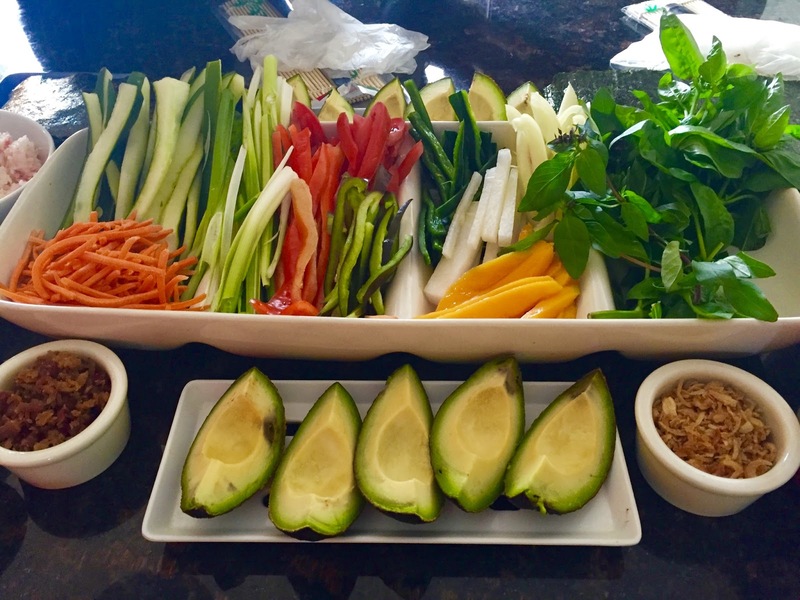 The Bamboo Panda Catering Company can do it all. “I feel I am here to enrich people’s lives through food.” The passion is clear. 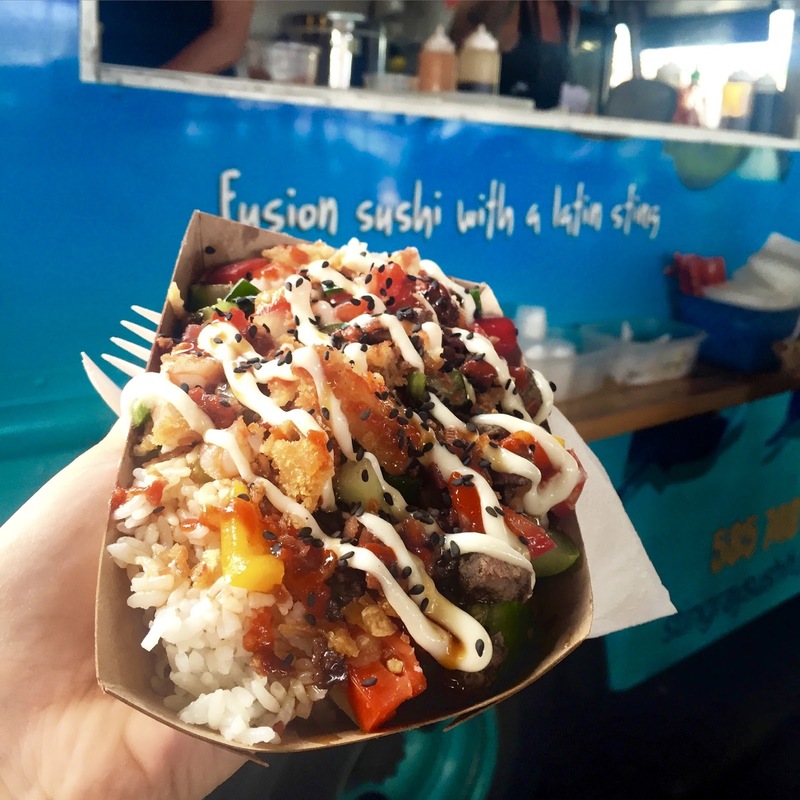 What is next for Rod, Kim and the Stingray Sushi Fusion food truck? They are on the lookout for another food truck and/or a store front location- yup I said it. This would be a dream come true, and I don’t just mean that for the co-owners- I am talking about the food truck fans! Click any of the highlighted orange links to look at the Facebook pages or contact Kim or Rod. This is the perfect blog for anyone who wants to know about this topic. I have known very important things over here. Thank you so much for this post.